The independent transport videos cameras have again been out and about in the capital recording more changes to the contemporary bus scene for you to enjoy. This is the second DVD programme in the occasional series recording the bus scene in London. 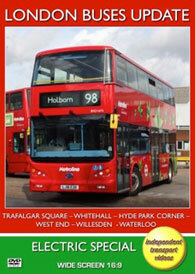 In this edition we feature the new electric buses, which are being introduced into London. They are BYD/ADL200EV single deckers operated by Go-Ahead now entering service on the 507 and 521 ‘Red Arrow’ routes and BYD K8SR Electric double deckers operated by Metroline which are allocated to Willesden garage now running on the 98 route to Holborn. We feature these vehicles in greater detail in the second part of this programme. The first part of this DVD was shot in early June 2016 and features various locations. These include, Trafalgar Square, Cockspur Street, Whitehall, Parliament Square, Hyde Park Corner, Duke of Wellington Place and Buckingham Palace Road. As you will see the New Routemaster now rules the road in these busy locations. A number of them now sport overall advertisements, which adds a welcome splash of colour amongst the standard red of the majority of London buses. At the time of filming some of the New Routemasters were receiving opening windows to their upper and lower saloons. These can be seen as the buses pass our cameras. Another point to note is that since filming, the earlier New Routemasters now no longer operate with their rear door open with an ‘attendant’ standing on the platform, so look out and see the final routes with their ‘attendant’ on the platform still in place! The second part of this programme was filmed on the 29th September 2016. Our locations include Tottenham Court Road, Oxford Street, Willesden, Holborn, Waterloo Station, Waterloo Bridge, Tenison Way and Waterloo Road. We take a ride from Oxford Street to Willesden bus garage on board BYD1475 (LJ16 EZR), a BYD K8SR Electric 10.2M double decker, on route 98. This almost silent journey is quite remarkable! Older viewers will be taken back to days of the trolleybuses, as we glide along the busy streets from the West End to the suburb of Willesden. The only sounds you will hear are the stop announcements, bell and almost silent electric motor propelling the bus along! On arrival at Willesden we film the action on Pound Street outside the busy Metroline bus garage, seeing both hybrid and diesel buses leaving and passing the garage. Our cameras then travel to Holborn onboard sister vehicle BYD1474. The final locations on this programme are at Waterloo. Here we film the rush hour with many types of buses passing our cameras. Brand new ADL Enviro400H City double deckers are seen on the 26 route operated by CT Plus. Look out for New Routemaster LT800 newly into service. From the older order we see a good number of Plaxton President and ALX400 double deckers operating some peak- hour specials. Keeping our ‘Electric’ theme we see many brand new BYD/ADL200EV single deckers on the 507 & 521 routes. Some are still to receive their ‘Buses’ roundel and Go-Ahead fleet names - they are so new! SEe24 (LJ66 CGG) is seen out on driver familiarisation. We hope you enjoy this update and we look forward to bringing you further editions in the future.